12th October 2017 marks the 100th Anniversary of the death in WW1 of former Hunter Valley mine surveyor Clarence Smith Jeffries. CITATION: For most conspicuous bravery in attack when his company was held up by enemy machine-gun fire from concrete emplacements. Organising a party, he rushed one emplacement, capturing four machine-guns and thirty-five prisoners. He then led his company forward under extremely heavy enemy artillery barrage and enfilade machine-gun fire to the objective. Later, he again organised a successful attack on a machine-gun emplacement, capturing two machine-guns and thirty more prisoners. This gallant officer was killed during the attack, but it was entirely due to his bravery and initiative that the centre of the attack was not held up for a lengthy period. His example had a most inspiring influence. “If the Coal Mine Surveyors of the Hunter Valley need a role model or a patron saint then they should look no further than Clarence Smith Jeffries”, so said David Dial, Military Historian, when addressing the second Gretley Information and Retraining Seminar at Newcastle on 26th November, 1998. David Dial presented a paper to the seminar titled “Historical Research and Methodology”. Although David’s forte is military history of the First World War, he was certainly very able to inform and entertain the delegates in a very entertaining manner, on what could easily be perceived as a very dry subject. David very kindly researched his database and came up with the information presented here and in the above citation. Captain Clarence Smith Jeffries VC, 34th Infantry Battalion, was born at Wallsend NSW on 26th October, 1894 and at the time of his enlistment in February 1916, he was in charge of the Survey Department of the Abermain Collieries. He was wounded in the thigh at the Battle of Messines on 9th June 1917. He was to be killed in action at Passchendaele, Belgium, on 12th October 1917, just two weeks before his 23rd birthday. 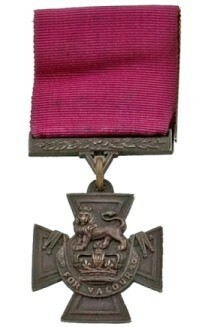 Captain Clarence Jeffries was the first Hunter Valley born person to be awarded the Victoria Cross in the history of the Australian Imperial Force. That Victoria Cross is now in the Christ Church Cathedral, Newcastle. Joshua Jeffries journeyed to Passchendaele in July of 1920 in an endeavour to locate the grave of his only son and child. He was not successful in finding the grave on that occasion, so on his return to Abermain he wrote to Australia House in London, requesting assistance in locating the grave. He also asked about the means used in identifying his son’s remains. Unknown to Joshua Jeffries, his son’s remains were exhumed on 14th September 1920, and interred in the Tyne Cot British Cemetery, near one of the German concrete pill-boxes that he had captured before his death in 1917. Joshua Jeffries was told that the remains were wrapped in a groundsheet with the initials CSJ pencilled on it, that there was also a set of Captain stars, and an “Australia” badge on the remains. The fact that no other captain with the initials CSJ was killed in the Passchendaele sector further supported the conclusion that the remains were those of his son. Joshua Jeffries did return to Belgium in 1924 to find at last his son’s final resting-place, seven long years after his death. In all 10,030 Hunter Valley men answered their Country’s call to fight for God, King and Empire during the First World War of 1914-1918. 1846 of these men were miners of the Hunter Valley coalfields. 60 miners were on the Gallipoli Peninsular between 25th April and 20th December, 1915. 13 were killed in action, 2 died of wounds and 1 died of disease. But it was on the Western Front battlefields of France and Belgium between 1916 and 1918 the Hunter Valley coal miners were in the greatest number, totaling 1,817. Of the 1,805 Hunter Valley men killed during WW1, 359 of these men were coal miners, of whom 249 were killed in action, 75 were to die of wounds, and 12 were to die of other causes. These statistics were kindly supplied by David Dial, Military Historian. Rick CAIRNS, AIMS-Limited, Retired Registered Coal Mine Surveyor.